See that greenery (right)? That's not a plant, it's a solar cell. Which is also a plant. Or which, more accurately, uses the plant's photosynthetic byproducts, consumed by naturally-occurring symbiotic bacteria, to generate electricity. 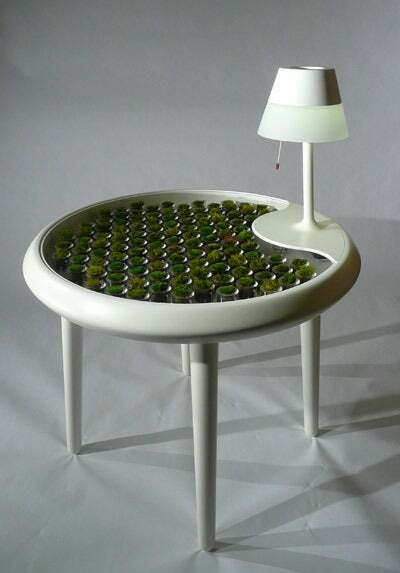 The Moss Table, covered in 112 such "moss pot" cells, was made as part of a project called "Design in Science" to showcase the emerging field of biophotovoltaics (BPV for short). Right now it's more a piece of art than a prototype of a real product--it produces power on a level comparable to the potato batteries you may remember from science fairs growing up, meaning it can power a digital clock and not a whole lot else. However, it points towards the potential of the field as a whole to remake solar power. One of the big ongoing problems with conventional silicon-based solar cells is their cost of manufacture, and the amount of energy required to produce them. Silicon photovoltaics use technology that's very similar to that used to produce computer chips, which requires lots of energy, dangerous chemicals, and highly-specialized facilities. By contrast, the most specialized parts in the moss system are the carbon electrodes currently used to collect the energy from each moss pot, and many of the advances which would allow the system to produce more energy--breeding the mosses or the bacteria to produce more energy, for instance--don't necessarily translate to higher implementation costs. So while the efficiency of biophotovoltaic systems is much lower in theory and practice than silicon photovoltaic systems (3-6% compared to 6-20%), they may prove to be more cost-effective and energy-efficient over their whole lifetime, and more easily deployed. Just imagine checking email on your laptop using the power generated by your moss-covered roof.